Dogs are sure to lick these bowls clean. These cool dishes will let pets know you care about them. B.. Dogs are sure to lick these bowls clean. These cool dishes will let pets know you care about them. .. 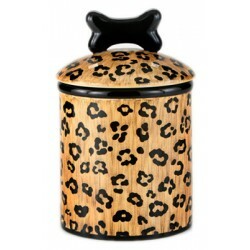 Dogs will love the treats that come from these fine ceramic treat jars with bone adorned lids. Small.. Dogs & Cats are sure to lick these bowls clean. These cool dishes will let pets know you care ab..